Libyan leader Moammar Khaddafy had a lot to say at the UN Wednesday. Be glad you didn't have to be there for it. Wacky Moammar Khaddafy's marathon speech at the United Nations merely bored the heck out of most who heard it, but it caused the poor sap charged with translating it to snap. "I just can't take it anymore!" 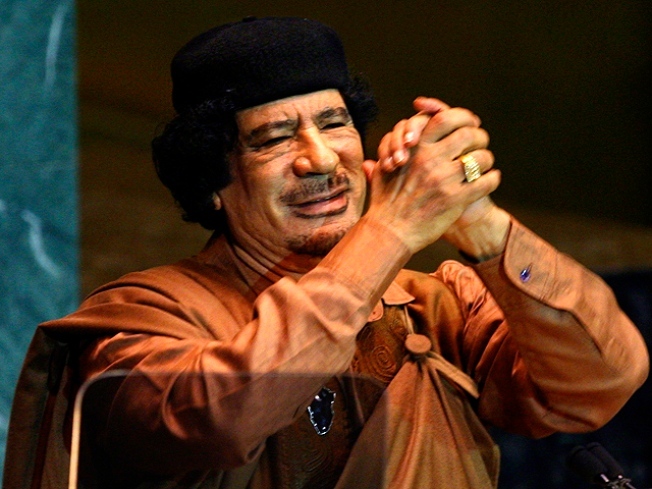 the interpreter shouted into his microphone in Arabic after the Libyan strongman had passed the one-hour mark. The New York Post reported that UN section chief Rasha Ajalyaqeen had to jump in and finish translating Khaddafy's ramblings. "His interpreter just collapsed," another UN interpreter told the Post. Khaddafy had insisted on bringing his own interpreters, according to the Post, saying the UN's translators couldn't do justice to the special dialect he planned to use. But when the kooky colonel spoke, it was in standard Arabic, according to witnesses who managed to pay attention. In the 100-minute speech, Khaddafy tore up the UN charter in a gesture of contempt, said the UN's Security Council should be renamed the "terror council," questioned whether swine flu could be a creation of western militaries designed to profit pharmaceutical companies and said African pirates were only hijacking ships because imperialists stole their fish. The bewildering rant capped a week in which Khaddafy wandered the tri-state area looking for a place to pitch his trademark Bedouin tent. He was chased out of Englewood, N.J., and Weschester County, N.Y., by angry townspeople and stickler building inspectors. Anti-Khaddafy fervor reared recently after the strongman gave a hero's welcome to Lockerbie bomber Abdel Baset al-Megrahi , who was freed from a Scottish prison because he has prostate cancer, aven though he was convicted of killing 270 people aboard Pan Am Flight 103 in 1988.